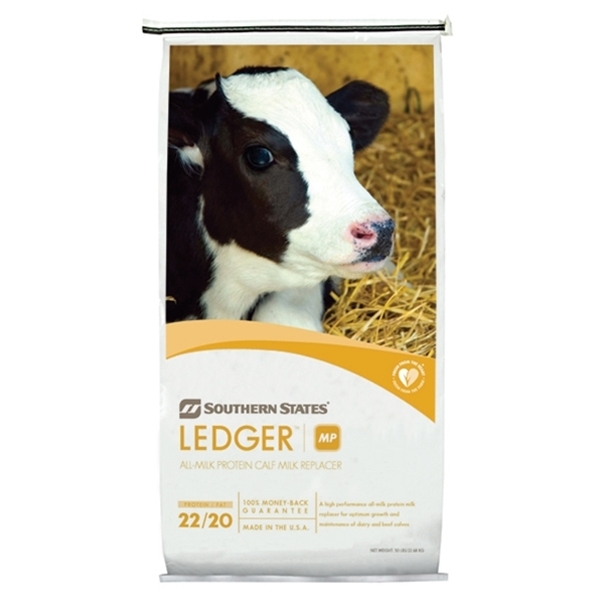 Southern States Ledger MP with (BVT) Medicated is a high performance all-milk protein milk replacer for optimum growth and maintenance of young calves. This medicated milk replacer powder contains Bovatec® for control of coccidiosis and should be fed to dairy calves from birth to 5-7 weeks of age. Its formula contains beta glucan for optimum gut health and immunity as well as FOS (Fructo-oligosaccharides) to promote the growth and activity of beneficial bacteria in the intestines. This milk replacer offers a unique profile of fat and carbohydrate to provide superior performance compared to 20/20 milk replacer or whole milk diets. Research shows that calves fed Southern States Ledger MP at 1.5 lb per head, per day had a 15 lb weight advantage, with increased starter intake and fewer scour days, due to its Architect® formulation technology. Conveniently comes agglomerated to mix quickly and stay in the solution. Seasonally available with the insect growth regulator ClariFly® to help control fly populations. – Always weigh milk replacer powder for accurate mixing. – Mix milk replacer powder according to the schedule below by adding powder to water as indicated and mix thoroughly. Feed immediately after mixing. WARNING: Do not add other sources of Lasalocid to this milk replacer solution. Always offer free choice water. IMPORTANT: Thoroughly mix milk replacer powder in warm water, and feed immediately. When preparing large batches (i.e., anything other than individual calf servings) keep the mixture agitated while dispensing into individual feeding containers to prevent any settling which could result in the feeding of improper levels of Lasalocid. If layering occurs, re-mix before feeding. MIXING AND FEEDING DIRECTIONS - Always weigh milk replacer powder for accurate mixing. - Mix milk replacer powder according to the schedule below by adding powder to water as indicated and mix thoroughly. Feed immediately after mixing.